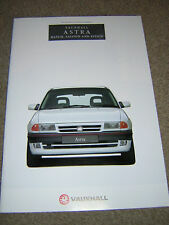 Original Sales Brochure for the 1994 Vauxhall Astra Range. Full Colour, 32 Pages/64 Sides. Good Clean Condition with no tears. 11.75" x 8.25. VAUXHALL ASTRA RANGE orig 1994 UK Mkt Prestige Sales Brochure. 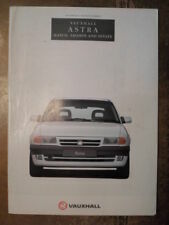 This is an original prestige sales brochure on the Vauxhall Astra range from February 1994 (1994 models, edition 2) with 64 pages / sides (including covers) and English text for the British Market. 28 page booklet, well illustrated, English text. Dated August 1994 and covers 1994-1995 models. 16 page booklet, well illustrated, English text. Dated August 1994 and covers 1994-1995 models. 60 page booklet, well illustrated, English text. 1995 edition no 1, dated September 1994 and covers 1994-1995 models. ITEM NUMBER V7393. PUBLISHED AUG 1993. pen marks on front page. Dated March 1994 and covers 1994 models. 14 page booklet, well illustrated, English text. 68 page booklet, well illustrated, English text. 1995 models edition no 1, dated October 1994 and covers 1994-1995 models. car sales brochure VAUXHALL 1994 models Omega Calibra Frontera Astra Corsa etc. LOT 564 - Vauxhall range profile 1994 brochure. UK = £ 1.50. ITEM NUMBER V10318 PUBLISHED APRIL 1994. Dated October 1994 and covers 1994-1995 models. 4 page folder, well illustrated, English text. Dated October 1994 and covers 1994-1995 models. Double sided single sheet, illustrated, English text. A standard A4 size stapled catalogue with 60 pages / sides, fully illustrated throughout and with English text. Very good condition. Original UK market colour newspaper format magazine issued by Vauxhall containing the latest news about Vauxhall cars in motor sport. Undated but c mid 1994. 4 page newspaper format folder, well illustrated, English text. 210 by 300 mm approx. 12 page colour glossy brochure dated 1994. Shows the Astra 1.6i and 2.0i convertible. Tigra - 1.4i 16v, 1.6i 16v. VAUXHALL RANGE Sales Brochure. Astra Convertible. Cavalier Hatch, Saloon - Envoy, LS, GLS, GLS V6, CDX, CDX V6, SRi 16v. Dated October 1994. Monterey 3 & 5 Door - RS, LTD, Diamond. 1994 models edition 2, dated May 1994 and covers 1994 models. 60 page booklet, well illustrated, English text. Original UK market colour newspaper format magazine issued by Vauxhall containing the latest news about Vauxhall cars in motor sport. Issue no 24, undated but c early 1994. 4 page newspaper format, well illustrated, English text. 36 page booklet, well illustrated, English text. Dated August 1994 and covers 1994-1995 models. 1995 edition no 1, dated August 1994 and covers 1994-1995 models. 6 page folder, well illustrated, English text. Dated February 1994 and covers 1994 models. 28 page booklet, well illustrated, English text. 20 page booklet, well illustrated, English text. 1995 models edition 1, dated September 1994 and covers 1994-1995 models. VAUXHALL ASTRA 1.6i & 2.0I CONVERTIBLES SALES BROCHURE. March 1994. Ref V10290. Very good condition. Sales brochure (as title). 8 sided full colour stapled brochure, A4-size. Original Sales Brochure for the 1981 Vauxhall Chevette, Astra and Cavalier Ranges. 64 page booklet, well illustrated, English text. 1994 models edition 1, dated October 1993 and covers 1993-1994 models. The cover has a picture of a Red Astra Mk3 Sport. P22-27 Astra Mk3 range, inc CDX & Sport. P28-31 Astra Mk3 convertible. P32-37 Cavalier Mk3 hatch & Saloon Range inc the SRi & CDX. Vauxhall range profile 1995 models, Edition No1, 68 pages dated October 1994, VM Ref No V7363. Astra Convertible - 1.6, 2.0 GTE. VAUXHALL RANGE Sales Brochure. Carlton Saloon & Estate - L, GL, CD, 3.0 GSi. Cavalier Hatch & Saloon - Base, L, GL, CD, 4x4, SRi, GSi. 1989 Edition Number 1. Publication No V736311. ECOTEC Engines. VAUXHALL ENGINES Sales Brochure. 1995 Models. E-Drive Engines. Diesel Engines. I HAVE A HUGE COLLECTION OF ALMOST 5000 AUTOSPORT MAGAZINES RANGING FROM 1950s TO 2007. 64 page booklet, well illustrated, English text. 21x30cm approx. Tigra - 1.4i 16v, 1.6i 16v. Frontera - Sport, Sport S, Estate. Vectra Hatch & Saloon - Envoy, LS, GLS, SRi, CDX. VAUXHALL RANGE Sales Brochure. Astra Convertible - 1.6i, 1.8i 16v. Monterey - RS 3.1TDS, LTD 3.1TDS, LTD 3.2 V6. 14 page booklet, well illustrated, English text. Dated July 1993 and covers 1993-1994 models. VAUXHALL ASTRA ARIZONA Sales Brochure. Astra Arizona 1.4i. Dated April 1995. I HAVE A HUGE COLLECTION OF ALMOST 5000 AUTOSPORT MAGAZINES RANGING FROM 1950s TO 2007. includes Technical Specifications. 8 page booklet, well illustrated, English text. 1994 models edition 1, dated August 1993 and covers 1993-1994 models. VAUXHALL ACCESSORIES Sales Brochure. Dated September 1992. I HAVE A HUGE COLLECTION OF ALMOST 5000 AUTOSPORT MAGAZINES RANGING FROM 1950s TO 2007. 14 page booklet, well illustrated, English text. Dated May 1993 and covers 1903-1993 models. 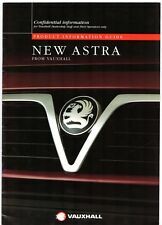 VAUXHALL ASTRA ATLAS 1.6i Sales Brochures. Astra Atlas Hatch Sales Brochure - 6 pages. 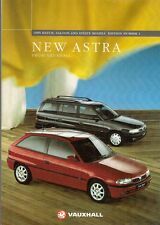 Astra Atlas Estate Sales Leaflet. Astra Swing 5 door. OLD CAR MAGAZINES and BROCHURES. Dated February & March 1995. VAUXHALL RANGE PROFILE 1995 MODELS UK SALES BROCHURE. None of the pages are loose or missing. Very minimal shelf wear and creasing to the cover. Models covered:-. No dealer stamp. VAUXHALL DRIVER'S CHOICE Sales Brochure. Carlton - GSi 24v, Diplomat, CDX, CD, GL, L. Astra Saloon. Astra Estate. Astra Convertible - 1.6i, 1.6i Sportive, 1.6i Elegance, 2.0i. Astra Convertible - 1.6, 2.0i GTE. Vauxhall 'Through The Years' Corporate History 1993 UK Market Brochure . Condition is Used. Dispatched with Royal Mail 1st Class Large Letter. 16 page booklet, well illustrated, English text. 1995 models edition 1, dated October 1994 and covers 1994-1995 models. Vectra Hatch & Saloon - Envoy, LS, GLS, SRi, CDX, 2.5 V6 24V. VAUXHALL RANGE Sales Brochure. Astra Convertible Colour Edition - 1.6i, 1.8i. Elite Saloon & Estate - 2.5TD, 3.0i V6. 1996 Models Edition Number 2.